Lee Kum Kee (Europe) Ltd. is based in the UK and is the controller responsible for this website. Lee Kum Kee (Europe) Ltd. is part of the Lee Kum Kee Group. 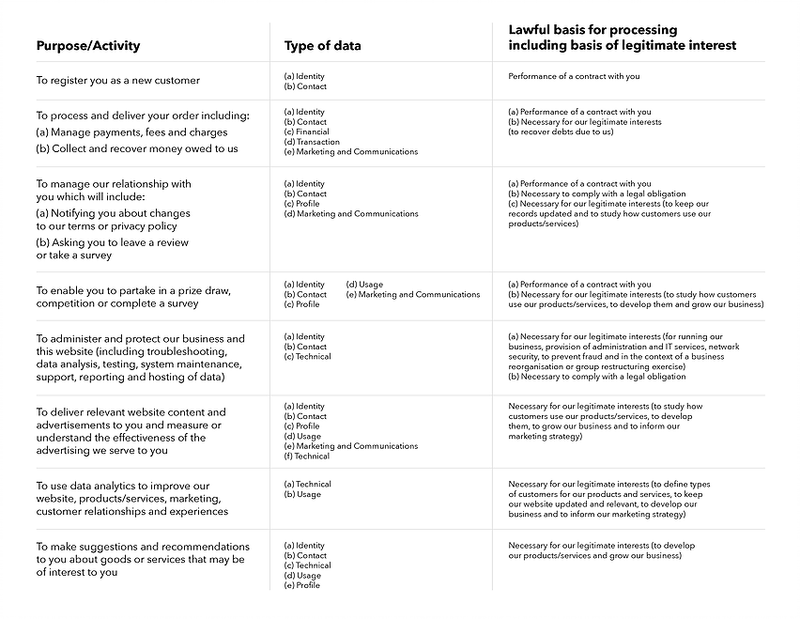 Where our relationship with the Group is relevant to your privacy, we have provided information on this in the sections below (see under Disclosing your Personal Data and Transferring Your Information). This version was last updated on 16 May 2018, and historic versions can be obtained by contacting us. Profile Data includes your username and password, purchases or orders made by you, your interests, preferences, feedback and survey responses], Education and profession; Hobbies and leisure activities; Other related products and services subscribed to; and Family and household demographics. search information providers such as Google, Bing, Yahoo based outside the EU. You can ask us to stop sending you marketing messages at any time by unsubscribing from each email sent to you as part of a campaign and by logging into the website and checking or unchecking relevant boxes to adjust your marketing preferences. In some circumstances you can ask us to delete your data: see under Your Data Protection Rights for Further Information. Any party as ordered by court or competent authority. For example, if we were served with a court order demanding certain customer information then we would need to disclose the information to the duly appointed officer of the court or such other persons as the court orders. Withdraw consent. This right applies only if we are relying on your consent to process any of your personal information. This will not affect the lawfulness of any processing carried out before you withdraw your consent. If you wish to exercise any of the rights set out above, please contact europe.enquiry@LKK.com. Full name of legal entity: Lee Kum Kee (Europe) Ltd.
Further guidance on your rights is available from the Information Commissioner’s Office (https://.ico.org.uk/). You have the right to complain to the UK’s supervisory office for data protection, the Information Commissioner’s Office at https://ico.org.uk/concerns/ if you believe that your data has been processed unlawfully. We would, however, appreciate the chance to deal with your concerns before you approach the ICO so please contact us in the first instance. Alternatively, if you are not based in the UK, you can contact either the ICO or the supervisory authority for data protection issues in the country in which you live, details of which you can obtain from us at the contact details set out above.